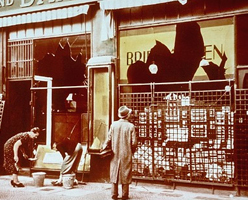 On November 9 and 10, 1938, the Nazis unleashed acts of terror and violence across Germany, Austria and the Sudetenland that became known as the Kristallnacht pogrom, or the "Night of the Broken Glass." Government sanctioned destruction targeted Jewish homes, synagogues and places of business. Over 30,000 Jews (mainly men) were arrested and sent to concentration camps. In this activity, students will engage with testimonies of individuals who experienced the Kristallnacht pogrom. They will learn about the experiences of these individuals, as well as the larger effects on Germany, Austria and the Jewish community in Europe. Additionally, students will gather information from both primary and secondary sources related to this event in order to construct a word cloud, or "word picture." The activity can be used alone or as an extension to Echoes and Reflections' Unit: Nazi Germany (http://echoesandreflections.org/unit-3-nazi-germany/?state=open#content).